KATHMANDU, July 24: The mass sit-in organized by civil society members from Sunday to express solidarity with the demands of Dr Govinda KC continued on Monday also. On Monday, Dr KC’s fast-unto-death completed 24th day and became his longest fast-unto-death so far. 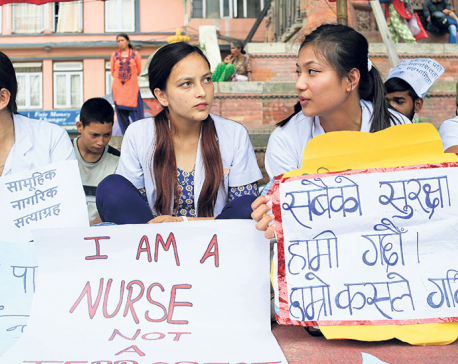 He started his 15th fast-unto-death demanding that the government withdraw the National Medical Education Bill from parliament and introduce it with the same provisions that were incorporated in the previous National Medical Education Ordinance to bring reforms in Nepal’s medical education sector. According to Solidarity for Dr Govinda KC Alliance, the movement supporting the demands spearheaded by Dr KC, the protests will continue until Dr KC’s demands are addressed. More than 100 civil society members including Bibeksheel Sajha Party leaders Ujjwal Thapa, Om Prakash Aryal and Bijay Babu Shiwakoti participated in the sit-in Monday, while about 200 others have registered their names to participate in the sit-in to support the cause championed by Dr KC. Those who took part in the sit-in on Monday include Rastriya Prajatantra Party (Rastrabadi) leader Dr Prakash Chandra Lohani, human rights activist Krishna Pahadi, former president of Nepal Medical Association Dr Kedar Narsingh Singh and former justice of Supreme Court Balaram KC among others. The Alliance has declared that the sit-in will continue on Tuesday also.